What is Gelato? Many of our customers try gelato for the first time in our Kauai store. They often ask, What is the difference between gelato and ice cream. Additionally, people who have tried gelato before or who have heard of gelato at times have misconceptions about what gelato is and how it is made. On any given day, we get 100’s if not over a 1000 people in our gelato and chocolate shop and our best guess is that 25-35% of our customers will ask what Gelato is, how it is different than ice cream, and other related questions. To help understand what Gelato is and why it is better than ice cream, we thought we would provide some information. First of all, Gelato means frozen (or at least most seem to agree on this) in Italian. Gelato and Ice Cream exist for the same purpose. Each was created to satisfy our desires for a cold and creamy dessert. Is there Gelatin in Gelato? No. We assume people think this because it is called Gelato. What makes Gelato … gelato? The simple answer is air or really the lack of it. While there are differences in the ingredients (minor), the real difference is the way the equipment is designed to make Gelato versus Ice Cream. Gelato equipment is designed to incorporate the least possible air into the mix as it is being frozen. Ice Cream equipment is designed to incorporate lots of air as it is being frozen. The more air in any frozen product, the higher the risk of ice crystals being formed and the colder and icier the mouth feel can be. Ice Cream has can have as much as 50% or more added air. 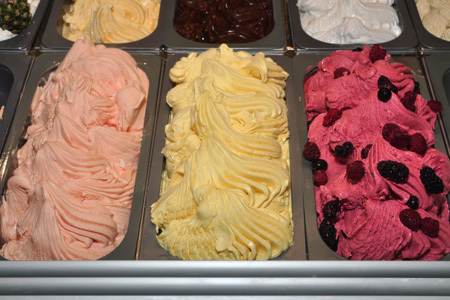 Gelato, depending on the flavor, will likely have no more than 15-20%. Less air means a denser product with a smoother and creamy mouth feel. The other big difference is the amount of added fat. Ice Cream’s must be made with a minimum of 10% butterfat and most premium ice creamsl have over 20% butterfat. Our Gelato has a less than 6% butterfat and 20-30% less calories than most ice creams. Our gelato base is not made with any ingredients containing gluten. This means all of our gelato flavors are gluten free unless we are adding a flavor, sauce, or other ingredient made with gluten. This means most of our flavors are gluten free and those containing gluten do so because of the specific flavor, like cookies and cream, pineapple upside down cake, pecan pie, brownies and cream etc. Why is Gelato lower in fat than Ice Cream? Again the answer is air. To compensate for the amount of added air, ice cream makers add heavy cream. Some add lots of heavy cream. Most ice creams will list cream as the first or second ingredient. This means lots of added fat. The more air in any frozen product, the more added fat you need to help create a smooth and creamy texture and mouth feel. If you have ever had Ice Milk, you have tasted a product made like ice cream (meaning lots of air) but with very little fat. So it is about the air? Yup. The air, or really the lack of it, makes Gelato different than ice cream. Butterfat also leaves a film behind on your taste buds which reduces how you experience the taste of something. Gelato flavors are more intense and one of the reasons is the reduced amount of fat. Is Gelato better for you than Ice Cream? You bet! But remember when Gelato was first being made, no one knew about how to determine how much fat and or calories were contained in food. They were just trying to make something cold, creamy, and delicious. Does Gelato always contain eggs? No. Eggs are used by some Gelato makers as an emulsifier, to add fat and flavor, or for specific flavors in which eggs are needed. Is Gelato Italian for Ice Cream? This is one of the questions we are oftentimes asked. The answer is yes and no. In the US and Canada, there are specific rules related to the labeling of frozen products. Ice cream in the US and Canada must have a minimum of 10% butterfat and specific amounts of dairy solids. So in the US, you can not refer to gelato as ice cream since gelato is so much lower in butterfat. In Europe, Ice Cream and Gelato are used to describe similar products. But back to the question, as mentioned earlier Gelato (pronounced jeh-lah-toh) is the Italian word for “frozen”. In the context of frozen desserts, gelato refers to ice cream. Outside the US and Canada, the terms are used in similar ways. Due to the regulations in the US, we can not really call our gelato ice cream since it has a much lower percentage of butter fat then ice cream products. Confused? Stop in and we can discuss over a nice creamy silky flavorful gelato! How much sugar does gelato have in it. I am fructose intolerant and was told I could have gelato vs I e cream, but with no explanation. There is no standard as far as sugar content in Gelato. Our sugar content will be different than many others as makes ours from scratch and not a premix. Also, the sugar content varies with each flavor as some flavors will have higher sugar levels than others. Also, fruit flavors will have sugars that are naturally occurring versus added sugars. So I can not give you an easy answer since there are variables. We do make no sugar added flavors. From what I see on the web, it seems that high fructose corn sweeteners are to be completely avoided but do not seem much about sugar avoidance. We do not use any high fructose corn syrups and most gelato makers do not. Maybe that is why you have been told you can eat gelato and not have symptoms. Not really sure however. Is it easy to make gelato at home? There are lots of recipes on the web for gelato at home. Depending on the type of ice cream machine you have, it is really just using the proper recipe and then adjusting the recipe if you are not happy with the result the first time you make it. The thing to watch out for with recipes is that many have too much cream to be authentic gelato. Many seem to have a 2-1 ratio of whole milk to cream. This means the percentage of butterfat in the recipe is too high and is really closer it an ice cream than a traditional gelato. I have seen recipes that call for both that ratio of cream to milk and egg yolks. This means your total fat content will be completely within the ice cream range so while you may end up with something you like, it will be more ice cream than gelato. You can take one of these recipes and just reduce the amount of cream so your ratio is more like 2 cups milk, to 1/2 cup cream. If your goal is to make a gelato, then you need to search recipes until you find one that seems to have the appropriate ratio of milk to cream. I live in Louisiana and recently bought a green tea gelato from a local restaurant for a party and quite a large container I might add. It has a powdery odd taste. Was this a fresh batch ? I didn’t recall this taste when we ordered it while dining ? In order to provide you with any meaningful insight we would have to be able to taste the product ourselves. There are many reasons why a particular batch of gelato (or any food product) could have a different texture or flavor than expected or as compared to another similar product. My recommendation would be to let the place know you were unhappy with the quality of the product and give them a chance to address your concern. Most businesses stand behind what they make or sell, so I am sure they would want to know you were not happy and be given a chance to address you concern. I am very sorry I could not be more help for you. I am an Indian and i am a manufacturing an ice cream in India,can i make a Gelato in my batch freezer in India. You would have to provide me with more information to be able to help you. Manufacture and model number please. We appreciate your kind comments. We will look forward to seeing you again in the future. I have I have Type II diabetes , controlled. Is gelato, as a rule, measurably better for me? Aloha Dr. Danner – Since gelato contains sugars I would have to defer to your doctor. I do not believe it is measurably better for you than ice cream or other frozen desserts made with sugar. While the fat and calorie counts are lower, there are sugars in gelato. Does your gelato contain soy? I have friends with a soy allergy and don’t want to serve them Papalani gelato if it contains soy. You mention you are dairy free so usually soy is used instead. None of our dairy free flavors contain soy, gluten, or nuts. Even most of our dairy based gelatos are soy free. Hope this answers your question!